The Boca Grande Sea Turtle Association released 70 baby sea turtles and one rare albino at the Boca Grande Community Center beachfront on Sunday, Aug 14. Turtle patrol volunteer Melissa Csank said Zone 2 patrol members excavated a nest three days after seeing signs of hatchlings emerging from the area. “They found approximately 70 hatchlings, including a rare albino trapped under a shelf of hard-packed sand. A situation had been created where there was a cavity of air under the sand and over the chamber, and they could not crawl up through the air,” Csank said. Csank added that the albino or leucistic (reduced pigment of multiple types versus just reduced melanin) loggerhead hatchling was found by Lisa Fultz and Kathy McClure, while excavating a nest on Zone 2. These are very rare – one in many hundred thousand hatchlings – and because they stand out, they rarely make it to adulthood. The main difference between an albino and a leucistic hatchling is that there is some ocular pigmentation in the leucistic turtle. Overall, nesting seems to be over. “While we have had a few nests and a few false crawls over the past few weeks, the intensive nesting is over, and we may have seen the last adult up on the beach this season. We have moved on to hatching, which is happening fast and furious up and down the beach,” Csank said. 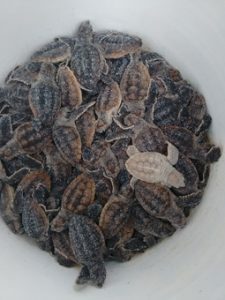 Approximately 75,100 hatchlings will be aided to the sea by BGSTA. On average, sea turtles lay 110 eggs in a nest and average between two and eight nests each season. The eggs will hatch in 45 to 60 days after a nest is covered. Only 1 in 1,000 hatchlings will survive to adulthood. They can live to be more than 100 years old. Hatchlings face many predators, both on their way to the water and once they get into the ocean. On the beach, birds, crabs, ants, bobcats, raccoons and coyotes and even unleashed dogs are common threats to nests and newly hatched turtles. Once in the ocean, they face a host of marine predators until they reach adulthood. If you find hatchlings on the beach, it is recommended you let them crawl to the ocean on their own, maintain a safe distance, and make sure lights are off so hatchlings don’t become disoriented. Do not remove them from the nest. If they are wandering away from the ocean or found during the day with birds circling, call the Florida Fish and Wildlife Conservation Commission at 888-404-FWCC for assistance. As of August 12, the association reported 751 Loggerhead (caretta caretta) turtle nests and 6 green sea (chelonia mydas) turtle nests on the island. There are no confirmed green turtle nests this year. A total of 1,075 false crawls have been reported on the island.